Monday: On Monday the kolam is drawn to honour Soma (Moon). The moon is said to bring feminine grace and beauty as well as mental clarity. It also adorns Lord Shiva’s hair. Tuesday: On Tuesday the kolam is drawn to honour the Navagraha (planet) Chavai (Mars). One is supposed to free from debts, poverty, illness, and breaks the bonds of attachment. Wednesday: On Wednesday the kolam is drawn to honour the Navagraha (planet) Budhan (Mercury). The kolam endorse prosperity and intelligence. It brings the blessings of balanced communication. Thursday: On Thursday the kolam is drawn to honour the Navagraha (planet) Guru (Jupiter). It builds constructive energies to bring wisdom, intelligence, and longevity to all who see it. Friday: On Friday the kolam is drawn to honour the Navagraha (planet) Sukran(Venus). It integrates energies to bring wealth, prosperity and abundance in all aspects of one’s life. Saturday: On Saturday the kolam is drawn to honour the Navagraha (planet) Shani (Saturn). This planet can create hardships such as delays, sorrows, restrictions and adversity which get lighten by this kolam. Sunday: On Sunday the kolam is drawn to honour Surya (Sun). It balance the energies for the entire week. Kolams are usually drawn with coarsely ground rice flour and with swift deft strokes. As legend goes, the rice flour is also food for ants and other insects. Red brick powder and coloured rangoli powder are used to enhance these kolams. During the Tamil month of Margazhi and on special occasions, the kolams take on a festive note too. Kolams during the festival Pongal are generously dotted with images of the overflowing pongal pot signifying prosperity and plenty. Some of the special kolams are Navagraha kolam and Iswarya kolam. 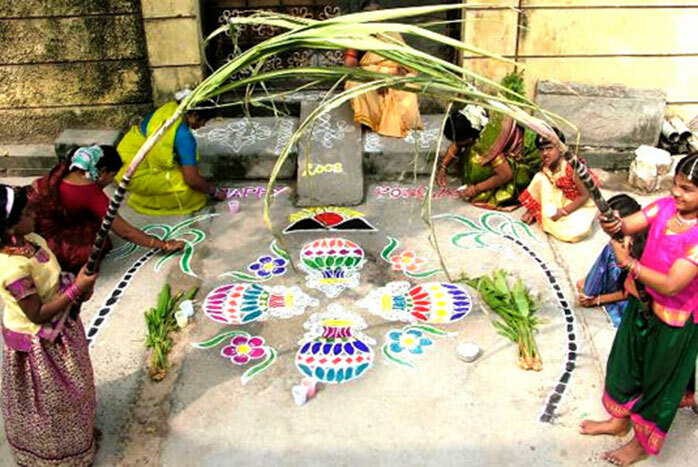 The month of “Marghazi” is eagerly awaited by young women; to showcase their skills by covering the entire width of the road with one big kolam. It is also a matter of pride to be able to draw large complicated patterns without lifting the hand off the floor. It is also a test of mastery as one cannot repeat a pattern for 30 days! Pongal in Tamil Nadu is what Durga Puja is in West Bengal, Baisakhi is in Punjab, Bihu is in Assam, Ugadi is in Andhra Pradesh, Makar Sankranthi in Karnataka and Onam in Kerala. The first day of Pongal is known as Bhogi Pandigai, the first day is an ode to Lord Indra, the bestower of the much needed rain. Because of his penchant for worldly pleasures, Lord Indra has been nicknamed Bhogi, or one who enjoys the good things of life. Indeed a description of this day is incomplete without the delightful and intriguing mythological legend accompanying it. According to the story, an irate Lord Krishna ( the blue coloured God and an incarnation of Vishnu, the Preserver) directed the earthlings to worship Lord Narayan (another incarnation of Vishnu) instead of Lord Indra, for the latter lead a decadent life. The insulted and humiliated Indra gave vent to his fury by lashing the earth with torrential rain. But Indra’s prowess provoked to be unequal to that of Lord Krishna, for the latter nonchalantly picked up the mighty Govardhan mountain on his little finger to protect the people from the deluge. After a heartfelt plea for pardon, a deeply repentant Indra was finally reinstated as a God worthy of reverence. The celebrations of Makar Sankranthi in other parts of India coincides with the second day of Pongal, which is also the first day of the new month of thai or magh (10th month of the Hindu lunar calendar).Each Tamil home has enchanting greens made of mango leaves decorating the doorways and pillars. Banana and sugarcane plants along with coconut fronds are strategically placed at the gateways, forming a leafy archway. Strings of marigold add a dash of colour, enhancing the freshness of the lush foliage. Women, young and old, decorate the floors with kolam (patterns made by coloured powders). Countless masterpieces are created in the form of kolams, with sugarcane and overflowing pots and complex geometric patterns, and the craftsmanship would probably put even the most accomplished artist to shame. Shown below are some of the different examples of the Pongal kolams created for celebrating the Pongal festival. 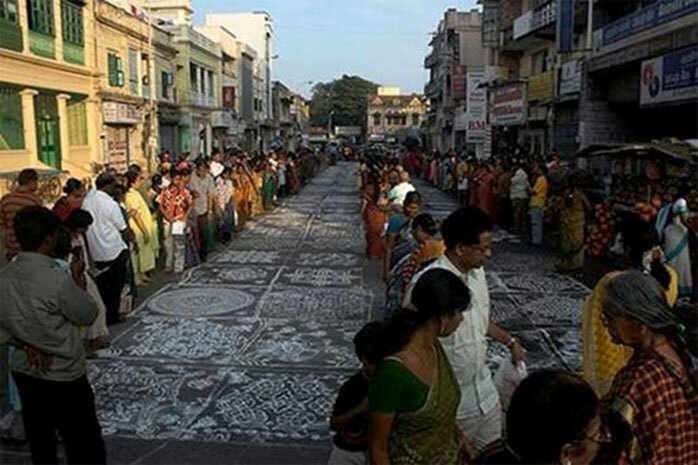 Sometimes kolam competitions are held during the Margazhi (Pongal) season. The test of skills on kolam designing and creating is the basis of these competitions. The winner is chosen based on the best kolam design created and also the skill and speed that have been used to achieve this. Shown below is one such scenario in Mylapore , Chennai. A whole road is blocked and the traffic is rerouted during such a kolam festival. This is a harvest festival- the Tamil equivalent of Thanks giving. It is held to honour the Sun, for a bountiful harvest. Families gather to rejoice and share their joy and their harvests with others. The Sun is offered a “Pongal” of rice and milk. 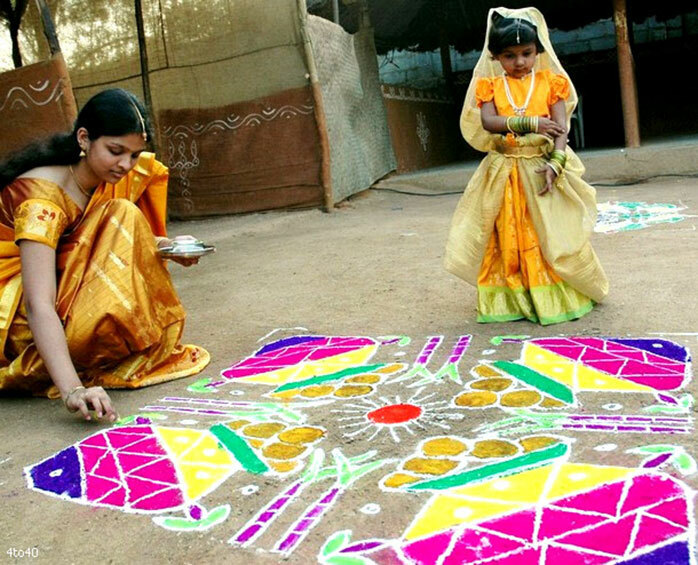 Rice flour (plain and coloured) is used to draw the kolam. Parellel straight lines can be drawn using a cylindrical rod (Ulakai) as a guide kolam. A kolam can be a plain one or can be artistically drawn with symbols of cosmic interest. The kolam defines a sacred area where the pongal is prepared. Within the perimeters of the kolam, typically, firewood is used to cook the rice. The Pongal is set up in the direct view of the Sun (East).Traditionally, the kolam is laid in the front or side of the house, but in cold climate where cooking indoors with firewood is hazardous, the pongal can be prepared in the kitchen and brought to the location where the kolam is setup.